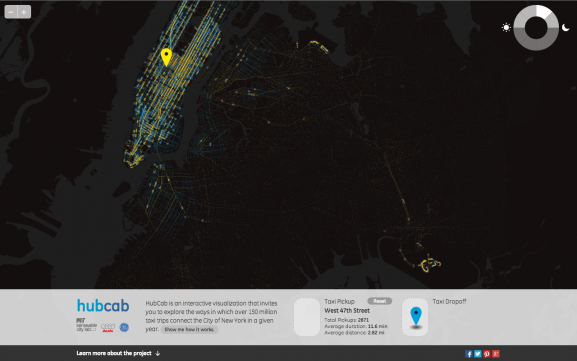 HubCab (hubcab.org) is an interactive visualization that invites you to explore the ways in which over 170 million taxi trips connect the City of New York in a given year. This interface provides a unique insight into the inner workings of the city from the previously invisible perspective of the taxi system with a never before seen granularity. 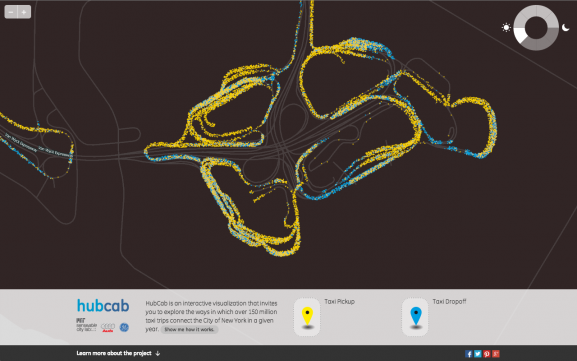 HubCab allows to investigate exactly how and when taxis pick up or drop off individuals and to identify zones of condensed pickup and dropoff activities. It allows you to navigate to the places where your taxi trips start and end and to discover how many other people in your area follow the same travel patterns. 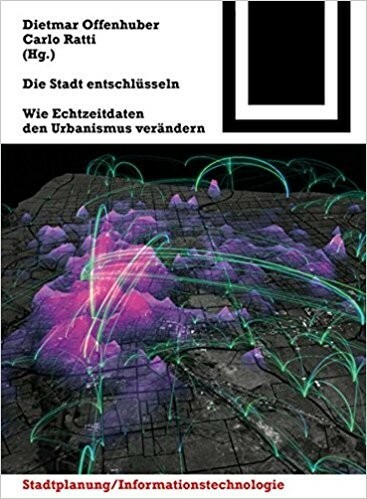 What do these visualizations tell us about collective mobility? How many of these cabs might you have been able to share with the people around you? And how might entertaining these questions be the first step in building a more efficient and cheaper taxi service? 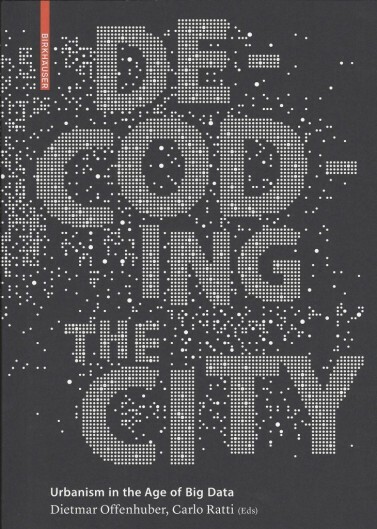 With an ever-increasing trove of real-time urban data streams, we are able to see precisely where, how, and at what times different parts of our cities become stitched together as hubs of mobility. By using these pervasive, interconnected, and “smart” technologies, we can begin to unravel the complexity of our travel patterns and identify how we can reduce the social and environmental costs embedded in our transportation systems. 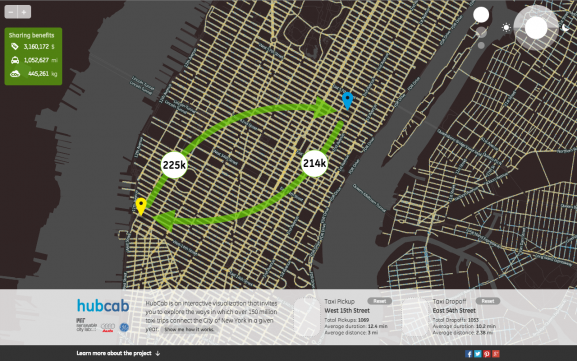 In HubCab we target taxicab services as a way to understand the linkages between our travel habits and the places we travel to and from most often. Left video: Seven days of taxi pickups (yellow) and taxi drop offs (blue) in New York (Mon Oct 24 2011, 0°° AM – Sun Oct 31 2011, 12°° PM). Please note: the activity drops down to almost zero on Saturday due to the 2011 Halloween nor’easter storm. 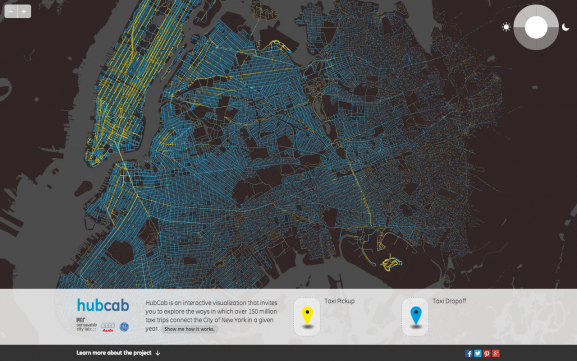 The HubCab tool expands and changes the perception of urban space using a large-scale data set. 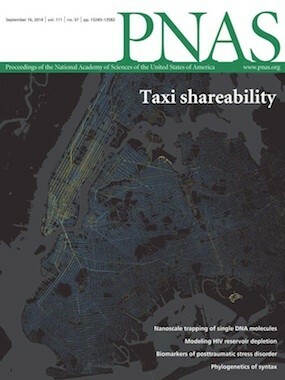 Studying this data, we show in a scientific study  the vast potential of taxi shareability. Our analysis introduces the novel concept of “shareability networks” that allows for efficient modeling and optimization of the trip-sharing opportunities. This mathematical approach makes use of network densification effects and represents a substantial advance over the existing state-of-the-art solutions to social sharing problems. Significant improvements of such a shared system are expected to lead to less congestion in road traffic, less running costs and split fares, and to a less polluted, cleaner environment . The sharing benefits displayed on the map refer to total fare fare savings to passengers, distance distance savings in travelled miles, and co2 emission savings in kg of CO2 that come from potentially shared trips. Our research  shows that taxi sharing could reduce the number of trips by 40% with only minimal inconvenience to the passengers. Here we assume this 40% shareability rate, together with the following highly simplifying assumptions: A fare of 3.00$ + 2.50$/mi , using Rate Code 1 not accounting for low motion fares or special surcharges, and average CO2 emissions of 423g/mi . Traveled distance is simplified as linear distance.